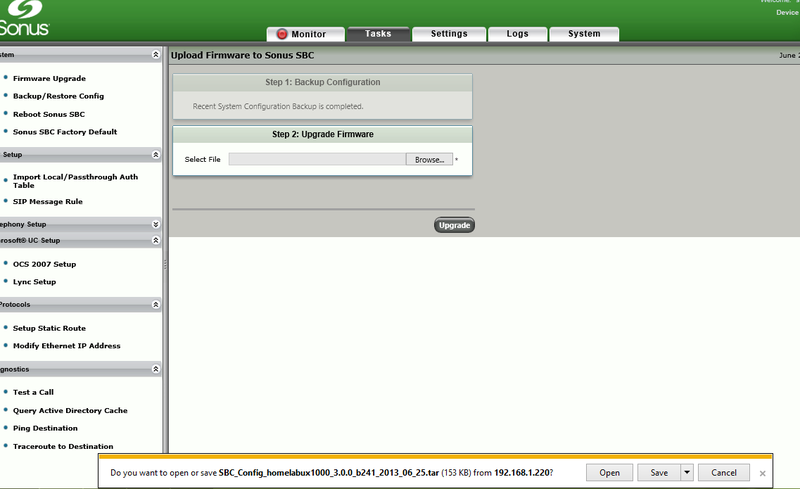 Also I will touch on any configuration changes that are required following the firmware upgrade. 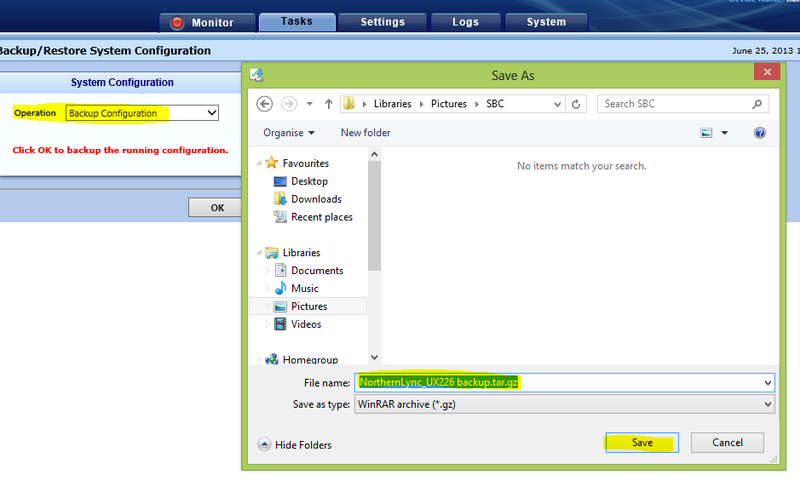 select the backup restore config option then in the right hand pane, select backup and then saveas. (ensure you give your saved tar file a good name for reference)! At a suitable time (out of hours is the preferred option, to mitigate the down time on the gateway), we need to upgrade the boot partition of the media gateway portion of the SBC/UX. To do this we need to navigate to the settings tab then system, then software Management, then select boot partition, then in the right hand window select upload boot image. (its worth noting your current boot version at this point as well). ***To note: the SBC/UX im running in this lab doesn’t have a ASM module so below are the details on what to do without the screenshots. 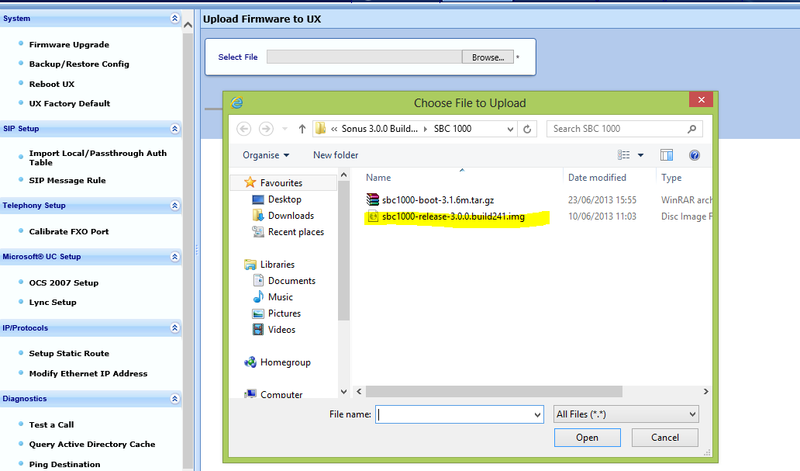 Select tasks, then select from the left hand options – Install ASM Update, now navigate to the UXCOMMSVC folder from the 3.0.0 download, and the select setup.msi. ensure it completes successfully before moving onto the following sets. The upgrade is taking about 5 minutes to complete in my lab, so you need to be patient. 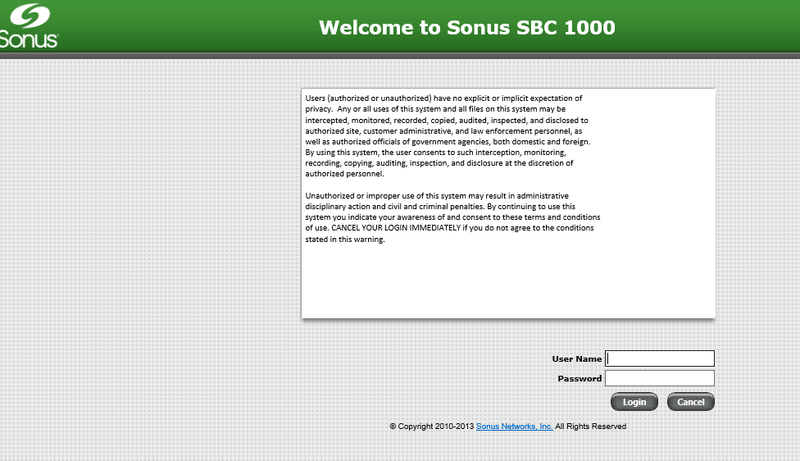 Once the upgrade is finished, the SBC/UX will reboot, and then you should be presented with the shiny new Sonus webportal.! 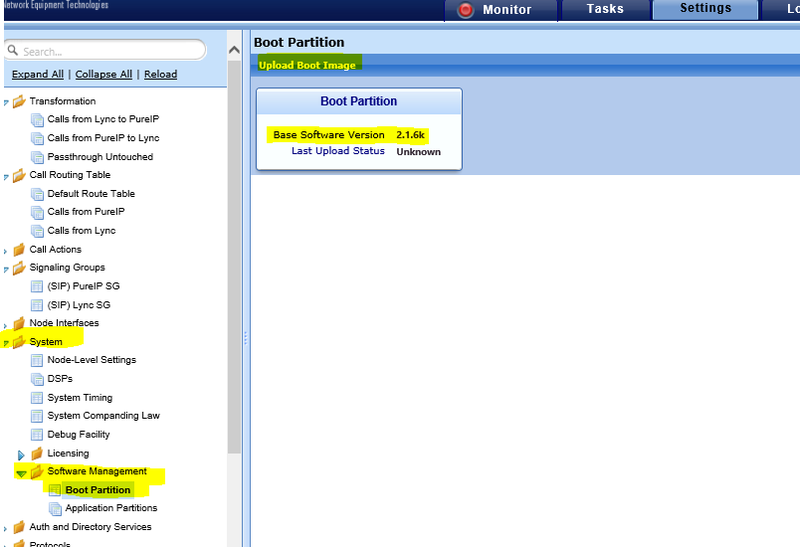 now jumping back to the settings tab, and system, you will also see following the reboot that the boot partition is also running as 3.16 meaning that if you require to hard reset the device this is the factory version you will presented with. — Last point then on this blog, as far as I can see nothing technically has changed and calls within my lab are still routing as expected to PureIP and vice versa, so no gotchas to be aware of at this point. Thank you to a unknown reader of my blog.! They pointed out a important piece which I missed from the blog above, if you are using SIP to SIP within your SBC/UX gateway, upgrading to 3.0.0 will require you to get a new SIP to SIP licence! Even though the above advises how to upgrade your device ensure you do read the release notes on the upgrade to ensure it covers your particular SBC /UX setup. 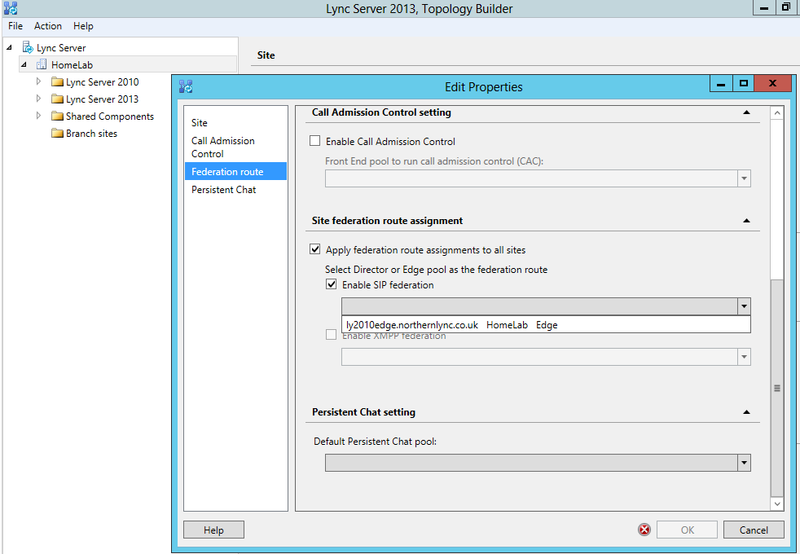 Following on to what seems to be a common gotcha of the presence being unknown for federated users when the users registrar pool is the newly built Lync 2013 environment. So to break this down for understanding. You have a Lync 2010 EE pool/Standard Edition with a Lync 2010 Edge estate. While users who are homed on the Lync 2010 topology can continue to federated with external users including seeing their external parties presence status, you are finding the new users who you have moved to the Lync 2013 estate don’t see the external parties presence.?? why? It seems most people put this down to the certificates between Lync 2010 edge and the Lync 2013 edge which could be the case if you haven’t set you Lync 2013 estate up correctly… Usually this problem is one that is easily overlooked and is a simple fix. If you open up the topology and navigate to the site level and edit the properties and look at the option (check box) which says Enable SIP Federation. My guess would be you don’t have this checked. 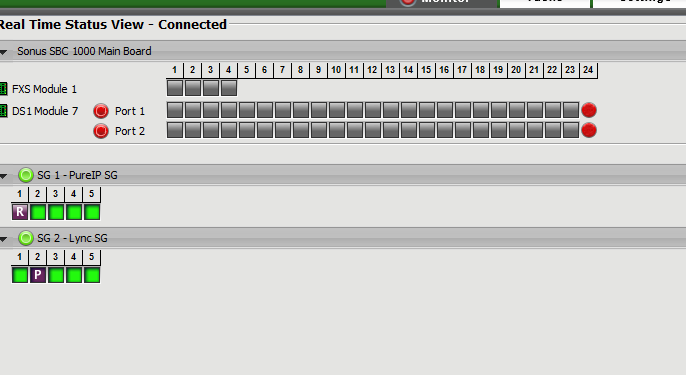 Select it then drop down the Edge server from the selection box. Recently I and another Modality colleague (Tom Arbuthnot, www.lyncdup.com) had a discussion around Lync 2010 and Lync 2013 coexistence and how and when to run the CU updates on both Lync versions/platforms in accordance with Microsoft’s Best Practice guidelines. From the conversation with Tom, and further investigation I thought it would be worth detailing the ‘do’s and dont’s for running the Lync CU updates sent from Microsoft periodically. So at this point if you are reading this blog post I’m presuming you are in the predicament on what to do next. 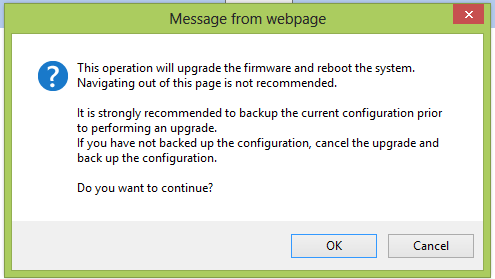 If your CMS store is still located on Lync 2010 then run the CU update for Lync 2010 as normal. 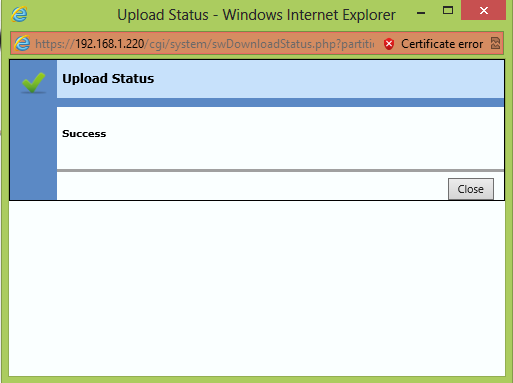 If your CMS store is on Lync 2013 run then CU updates for Lync 2013 as normal. SIMPLE RULE !! Don’t ever run the SQL update part of the CU update on the Lync version where the CMS store ISNT located. In an example, I have a Lync 2010 environment running CU7 and a Lync 2013 environment running RTM and the CMS Store is still located on Lync 2010. In this scenario you can update Lync 2010 with CU8 including updating the SQL backend database as per CU instruction. To update Lync 2013 you only run the CU1 update for the components only and NOT (and again NOT) the SQL database update!! If you have moved your CMS store from Lync 2010 to Lync 2013, then updating Lync 2010 is only the components only and NOT the SQL update part. And for Lync 2013 which now homes the CMS store, run the full CU update including the SQL update part.